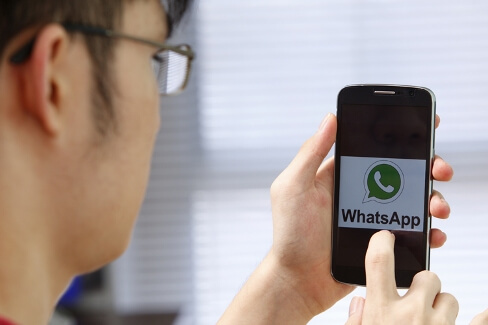 WhatsApp: Is it affecting the quality of communication? In our society today we know that we are fully immersed in the technological era, the virtual and remote communications. Contact “face to face” is becoming obsolete and is being replaced at a staggering speed by contact through networks such as WhatsApp, Facebook, Twitter and other applications and networks that allow us to have conversations without leaving our home. Undoubtedly the amount of benefits at a practical level and speed of the new technologies but … Does it affect communication such virtual contact? Does it interfere in some way, perhaps makes it more difficult? Or conversely, is it equally effective in all aspects of communication compared with “live”? To begin to discuss this issue must be borne in mind that communication is based on three aspects, the locutionary, illocutionary and perlocutionary act. This way the experts refer to the consistent act in saying something, intent or purpose of the speaker and the effects or consequences produced of this, respectively. In this sense, it is very interesting to know the contributions of Canadian cognitive psychologist David R. Olson. This author has thoroughly investigated the relationship between written culture and thought. Among his main reflections, Olson says that it is not possible accurate transcription of speech to read or written language. His justification was based on the fact that, with the passing of speaks to the reading; we lose the illocutionary language ability since the model itself does not represent the above mentioned capacity. Thus, based on this theory, virtual communication remains in effect, the perlocutionary and the locutionary act. But what about the illocutionary act? In speech communication are included many aspects that would be lost in written communication. As the prosody, which would include a lot of relevant communicative aspects, as would be the height of voice tone and employees (more acute can denote nervousness and high can mean discontent), accent and used intonation. And going even further, in the case of speech communication “face to face”, with respect to the virtual, we would be losing all nonverbal information. See where leads the look, movement and body posture, gestures, facial expression… etc. While on the other hand, it is not the same communicate virtually an unknown person with a known person. In the latter case they come into play a number of factors such as experiences with that person, the knowledge in memory that you could have on their personality, the subjective perceptions about him… etc. All this leads to a series of expectations, perceiving the things that he says being able to see “further away” of what he says and to see how he says it, in measurement of the possible thing. These aspects would lead us to make certain inferences about what potential it is the communicative intention of our interlocutor or, as mentioned before, his illocutionary act. Seen all the above, we can conclude that is the virtual communication same as talking face to face? Of course, not. But it would not be sensible to consider that communication through new technologies should be sentenced and disposed of our lives. The fact that online communication dispenses with the illocutionary act is a half-truth. Actually, this important aspect of communication largely depends on many factors. For example, the degree of knowledge of the other person, passing by the writing level and ability in written expression of the interlocutors, up to the level of reading comprehension of the receiver. In addition, it is worth to note that virtual communication applications incorporate a wide range of emotions, stickers and sounds through which you can meet, with all the natural limitations, this type of understanding illocutionary that theoretically would be excluded in this type of communication 2.0.